SALT LAKE CITY – Redshirt-junior Dedric Lawson’s 25-point outing combined with a stellar defensive performance by the Jayhawks saw No. 4 seed Kansas cruise to an 87-53 victory over No. 13 seed Northeastern in the first round of the NCAA Championship Thursday afternoon inside Vivint Smart Home Arena. Lawson posted his 21st double-double of the year and led all scorers, while the Jayhawks held the Huskies to just 28-percent shooting from the field. Kansas advanced to the second round and will face No. 5 seed Auburn on Saturday, March 23. The win moved Kansas to 26-9 on the year and gave the Jayhawks their 13th-straight NCAA Tournament first round victory. Northeastern’s campaign came to an end at 23-11. As was the case all day, it was Kansas’ defense that set the tone and helped it build a double-digit lead over the first 20 minutes. The Jayhawks held the hot-shooting Northeastern team, which entered the day shooting over 48 percent from the field on the year, to just 26 percent in the opening frame. The Jayhawks had trouble pulling away from Northeastern early, as the Huskies’ prowess from beyond the 3-point line kept the contest close over the first 12 minutes of action. Lawson tallied each of the Jayhawks’ first seven points before Devon Dotson and Marcus Garrett’s ability to get to the rim helped Kansas build an 18-11 lead with 11:34 to play in the half. NU got the game back to a single possession after an 8-2 run, capped by Vasa Pusica’s triple at the 7:59 mark. That bucket pulled his team to within 20-19. The Jayhawks didn’t panic, however, as Lawson continued to dominate the Huskies in the paint. The forward tallied nine points during a 17-6 KU run to close the half and help the Jayhawks regain control before the break. Dotson ended the run with an acrobatic lay-up with 38 seconds before the buzzer to give Kansas a 37-25 lead heading into the intermission. Kansas came out of the locker room and got the second stanza off to a sluggish start. The Jayhawks posted three turnovers over the first three minutes and saw the Huskies start the half on a 5-0 run. That quickly cut their deficit to seven points, prompting a Bill Self timeout. Self’s words in the huddle proved to be useful as his team responded with a 32-6 run over the next 10 minutes to push its lead to over 30 points. That stretch was kick started by back-to-back 3-pointers from Quentin Grimes and Lawson, before K.J. Lawson and Dotson took over the bulk of the scoring load. The duo tallied 18 of their team’s next 26 points and helped Kansas’ lead swell to more than 30 points with just over six minutes remaining. Dotson’s first 3-pointer of the day at the 6:29 mark pushed KU ahead 69-36. During that stretch the Jayhawk defense was just as impressive, holding the Huskies to just two field goals and forcing four NU turnovers. Northeastern never managed to get back within 25 points of the No. 3 seed as five different Jayhawks notched a bucket over the final six minutes of action. Mitch Lightfoot’s 3-pointer with 15 seconds remaining, Kansas’ eighth of the day, sealed the 87-53 victory, which saw the Jayhawks advance to the NCAA Tournament’s second round for the 13th-straight year. Dedric Lawson turned in an impressive 25-point, 11-rebound performance for his 21st double-double of the season in the first NCAA Tournament outing of his collegiate career. His stat line included a 3-of-5 clip from 3-point range, marking the fourth time this season the Memphis product has connected on three or more triples. Dotson was next on the KU scoring chart with 18 points after scoring nine in each half. K.J. Lawson and Agbaji turned in 13 points apiece and combined to go 12-of-22 from the floor. 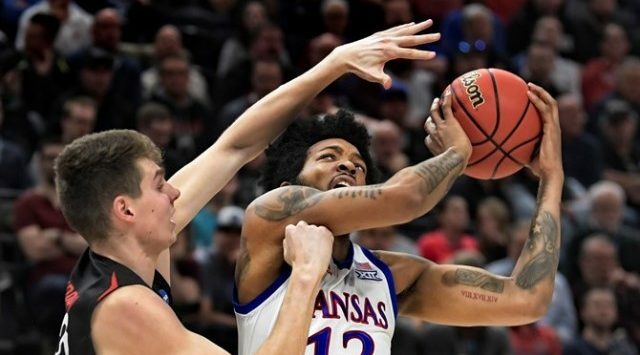 As efficient as KU’s offense was in the victory, which saw the Jayhawks shoot over 70 percent in the second half, it was the Kansas defense that was the highlight. KU held Northeastern to a season-low 28.1 percent clip from the field and held the Huskies’ top-scorer, Pusica, to only seven points on 2-of-13 shooting. The Jayhawks also kept the sharp-shooting Northeastern squad off the 3-point line, holding the Huskies to their second-worst 3-point-shooting day of the year at 21.4 percent (6-of-28).